Duckblind will have AC soon!! Re: Duckblind will have AC soon!! Just got a call from the shop..THE DUCKBLIND is done!!! He said they filled it with oil and letr it set overnight. Came in today and turned her over...low and behold she was blowing cold air!! Not sure ...but I guess sitting with the oil in it and charged...perhaps it had an air bubble or something in the system? All I know is I get her back today....WITH AC!!! Woo hooo!!!! Why would fittings cause it not to function? Are these the fittings with integral valves? Shaft covered by an aluminum cap? If so are they configured correctly, fully CCW? Your pichers don't work for me today. Worn fitting won't cause it not to function. If these have the service valves built in the worst that could happen is you couldn't back seat them so the service ports would always have system pressure on them. Still shouldn't leak but easily checked with soapy water. Or the valve stems could leak if their seals were bad. Again easily checked with soap. Well, I suppose the threads on the valve stems could be stripped so you couldn't operate them but they should've found that up front. They squirted soap on one and it was bubbling. Is there a seal in there that could be worn? SJTD wrote: Worn fitting won't cause it not to function. 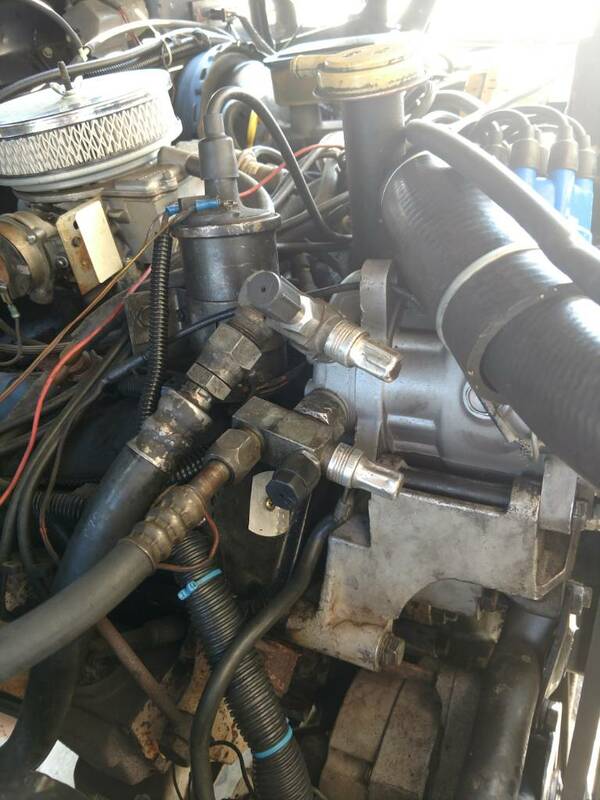 "Grand Wagoneer AC Compressor Hi & Low Side Charge Valve Service Port Set" I need to know where I can find a replacement set of these. Preferably new ones if at all possible. I called the shop and he said that the fitting was leaking where you open and close the port. That narrows it down a LOT. Now I just have to find a replacement. Anyone know of a place I could call? I am having zero luck online searching for the part. I found a site that may be helpful for others...they have compressors, hoses, fittings...all shapes and sizes!!! the R134 has a little more pressure and is a little smaller molecule so it will leak more easily, so O-ring fittings are the preferred mode of installation. But a good fitting from the old style metal jacket still work, works on the old honda. Its odd, I started her up this morning and the AC was blowing cold air. Yet when It gets hot, it does not....what would cause it to do that? What was the outside temp? Obviously it's easier to cool 70 degree air than 100 degree air. Do you still have the leetle sight glass on the fender? Or maybe one on the drier? There's a good AC forum I've been trying to remember the name of. Run by a AC parts supplier in FL or AZ. I have seen the little window u are talking of and yes, I agree on the temps. But it should not go from cold air to warm air that much. HowardT64 wrote: I have seen the little window u are talking of and yes, I agree on the temps. But it should not go from cold air to warm air that much. you should have a binary switch installed by the little glass viewing part, the binary will shut off if too or too high pressure, the old switch only worked when low pressure. Because R134 requires a higher pressure, the binary switch is needed. There are even triple switches but forgot the third event. Is the pump running when it isn't cooling? If not the switch letank mentioned could be the problem. If the pump is running what do the hoses feel like? Can you reach the expansion valve behind the AC and see if it's cold? What do you see in the sight glass when it's running? I've read that a properly charged 134 system will have bubbles but I don't know that it was a reliable source of info. I'm looking forward to getting my system running some day since it will have the glass and I can experiment. My cynical side says it was removed from modern systems to discourage untrained unlicensed guys like me from working on them and to save money. Now systems are charged by weight. Maybe the equipment manufacturers are in cahoots with the EPA. Saves the car makers a few bones too. Certainly easier for them to install 27 ounces of refrigerant rather than starting the motors up and charging by pressures/temps/visual check. Last edited by SJTD on Fri Jun 08, 2018 1:03 pm, edited 1 time in total.